The Town of Port Royal in South Carolina has made a realty name for itself as an excellent investment alternative to Beaufort SC. It presents real estate options for those wanting to benefit from a close proximity to Beaufort, but who prefer more rural or more economic choices. The Town of Port Royal is in the southern part of Port Royal Island, between the Beaufort River and Battery Creek. It is a deep-water, waterfront community with carefully maintained links with the natural environment as its location. The Old Village part of Port Royal is a rare find in the middle of modern urbanity. Residents enjoy easy access to a unique outdoor setting via boardwalks and walking trails while holding onto the quaint fishing village ambience which sets the tone for many an evening stroll. Using this location criterion as a central point for considering homes for sale in Port Royal SC, there are two broad areas Port Royal real estate can be divided into: Paris Avenue East and Paris Avenue West. Listings for Paris Avenue East are in the area considered the "Old Village" area. This superb location, walking distance to downtown and the Sands Beach, offers excellent value for money. On the banks of the Beaufort River, for under $1million, you can own a three bedroom home making prime use of the exceptional views across the Intracoastal Waterway. There is nothing more satisfying for a real estate agency to be able to share a unique well-priced property deal. Overlooking the Beaufort River, not one but two side-by-side properties are for sale with a shared dock and a boat lift. 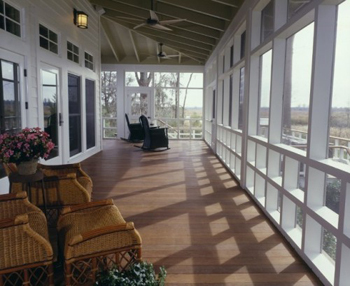 From your screened in porch watch the sun going doing and enjoy a crab dish – freshly caught from your own dock! To take a slow kayak cruise, just launch off from your own yard. This is one of those properties that is perfectly positioned, 5 minutes from grocery stores, and more importantly, perfectly priced. Listings for Paris Avenue West are just west of the "Old Village" area and across Ribaut Road. This collection of homes for sale in Port Royal offers outstanding variety at astonishing prices. Usually found in only the most metropolitan of international cities, there is a unique living and working town-home for sale located in Historic Port Royal. In this exclusive five unit cluster, the first floor is perfect for a small business leading to a second floor boasting open concept living with classic dark wood finishes. If you are looking for something a bit more traditional, look no further than this double story home with its appealing double front porches. Priced under $300,000 and positioned minutes from Sands Beach boardwalk and boat landing, it is definitely worth packing a picnic basket and going to take a look. These homes for sale in Port Royal SC are just a taste of a wide range of possibilities to showcase the huge opportunities which exist in this town with a big heart. For investors and families alike, finding waterfront property along the South Carolina coast of the quality and price that exists in the Town of Port Royal is almost unheard of. With its rich history and community-oriented residents, this is a sought-after location for outdoor enthusiasts who love the water and respect what it means to be a neighbor. Conveniently situated close to the Port Royal Elementary School, children safely walk to school as they can to the Sands Beach or along the new dock walkway in their free time. The commitment to family life and community togetherness is the underlying ethos of Port Royal’s “walking neighborhood” design. Take a moment and imagine living here; imagine calling this special town “home”. There is no time like the present to make the call and to take that drive. Russ and Deb Fielden will assist you in every possible way. And in Port Royal SC, that’s not the only promise you can count on.